First Whale of the Season Spotted! We wanted you to be the first to know that our 2017/2018 Humpback Whale Season has officially begun! Today, Captain Kimo and first mate Pono’i got to see the very first Humpback Whale of our 2017/2018 season from aboard our Glass Bottom Boat! Pono’i tells us that around 10:30 this morning, he was looking out to sea and saw some splashing about 800 yards or so outside of Anaeho’omalu Bay. It was really, really windy, so at first, he and Captain Kimo thought they were seeing some Spinner Dolphins passing by the entrance of the bay. 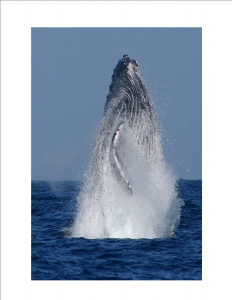 They kept watching though, and were completely surprised by a full breach from what they described, as a BIG Humpback! Were those first little splashes from a young calf, who was upstaged by Momma? Or were we seeing a lone whale agitating the surface a few times before breaching? We really don’t know…but what we do know is that from now on, we’ll be scanning the horizon every chance we get for more of those early arrivals! Since we won’t be running dedicated Whale Watch Cruises until December 1st, we invite you to join us on any of our Snorkel Adventure Cruises or Sunset Cruises and help us search for more of our first Kohala Coast Humpbacks! Don’t miss the excitement — call us at 808.886-6666 ext. 1 today — and don’t forget, our 2 for $160 Gift Certificates are still available for purchase! Oh, and for those of you who read about and entered our “Guess the First Whale Contest”, we want to thank you for playing! Unfortunately, no one guessed the correct day (most predictions were for days in November)…and to be honest, based on last year’s first sighting on Thanksgiving Day, we were predicting a similar date. What a happy surprise!